I was just talking about obstacles yesterday, right? Well, I had a doozy last night! My class ended late so I couldn’t make the 7:12 train like I had wished/hoped to so I took my usual 8:45 (class ended up at 7:05! just missed it!). It was no big deal but 2 stops out, the train broke down! We ended up having to board the original 10:50 train from Philly. Long story short, I walked in my house last night at 12:50 and I had left yesterday morning at 6:30AM! What a day! But it was no big deal. I wasn’t too tired to drive (because of a large meal late in the day) and there was nothing anyone could do about the problem. I’m safe and got to sleep in since my class isn’t until 3:30 today! Needless to say, I did not hit the gym yesterday. Nor today because I got my 8 hours. This weekend is going to be another toughie. I’m not that busy but I have tons of school work, I may even skip rugby this weekend! I gotta do what I have to! You need the bench/chair/box for the step ups and for leaning on while you do your single armed tricep extensions and rows. The numbers for jumping jacks and ski lunges are the minimum I think you should do. If you are in great shape and need to do more to get your heart rate up, then by all means, do it! Don’t forget to stretch after! Finally, I’m not a health professional in any way. 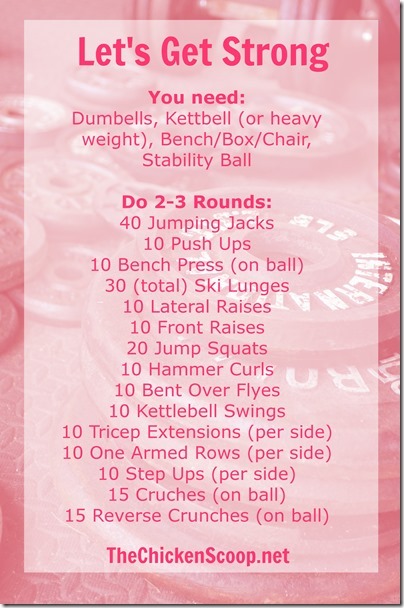 I just make these workouts for myself and like to share them with others. Please consult your doctor before starting any sort of exercise regime. 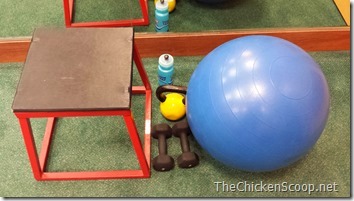 If you have limitations, work with a physical therapist, trainer, etc. Don’t hurt yourself! Now, I must be off. Ask me if you need help finding or understanding any of the moves. You can find most of them with a simple Google search Enjoy! That looks like a doozie! Sorry to hear about your train issues…and your long day! Soon you’ll get a little break and get some rest! WAHOOOOO!!! another doozie. I just did your 8set full body circuit today. love them!